(Newser) – Alabama lawmakers are calling for the resignation of a small-town newspaper editor who published an editorial calling for the Ku Klux Klan to return and "night ride again." The Feb. 14 editorial in the weekly Democrat-Reporter in the west Alabama town of Linden called for the KKK to act against "Democrats in the Republican Party and Democrats" for "plotting to raise taxes in Alabama." When contacted by the Montgomery Advertiser, editor and publisher Goodloe Sutton confirmed he had written the editorial—and doubled down on his remarks. 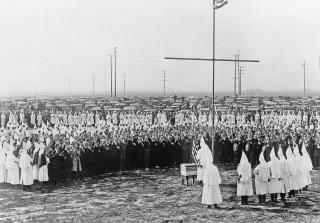 "If we could get the Klan to go up there and clean out DC, we'd all been better off," Sutton said, explaining that by "cleaning out," he means lynching: "We'll get the hemp ropes out, loop them over a tall limb, and hang all of them," he said. This Goodloe guy will soon be Trump's new White House Press secretary replacing Sarah Huckabee Sanders.